I really love to bake something in the beginning of the week to make breakfast easier for the rushed school mornings. 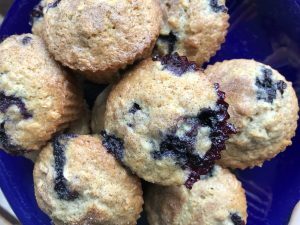 These have old fashion oats and walnuts in them, you’re getting both fiber and protein in this little muffin, both help to keep you feeling fuller longer. I do my best to be allergy friendly and I know that eggs are a common one. Well I’m here with some pretty super news. You can absolutely bake without eggs! I found this little hack once when baking and had run out of eggs. For one egg you substitute 2 tablespoons water and 1 tablespoon oil. No eggs, no problem! In a large bowl first combine your dry ingredients, flour, oats, sugar, salt and baking powder. Then stir in your wet ingredients egg, milk and oil. Once combined gently fold in walnuts and blueberries. In a muffin tin, using silicone liners or greased, fill half way up with muffin mixture. Sprinkle cinnamon sugar mixture on top of each muffin and bake 20-25 minutes in a preheated 350 degree oven. My tip for this recipe is to use fresh blueberries. So many recipes with blueberries in them say to use either frozen or dehydrated blueberries. I really like the fresh ones, they kind of explode in the muffins while they bake. I feel it gives you more of a gooey all over blueberry flavor rather than the berry staying intact. Frozen berries also have a tendency to sink to the bottom of your batter because they weigh more, then you end up with just berries at the bottom of your muffin instead of all throughout. 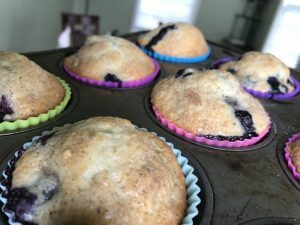 I really love to use these silicone baking cups, especially when I use the fresh blueberries, when they do explode into yummy goodness, you’ll have no trouble getting the muffin out of the tin to enjoy. 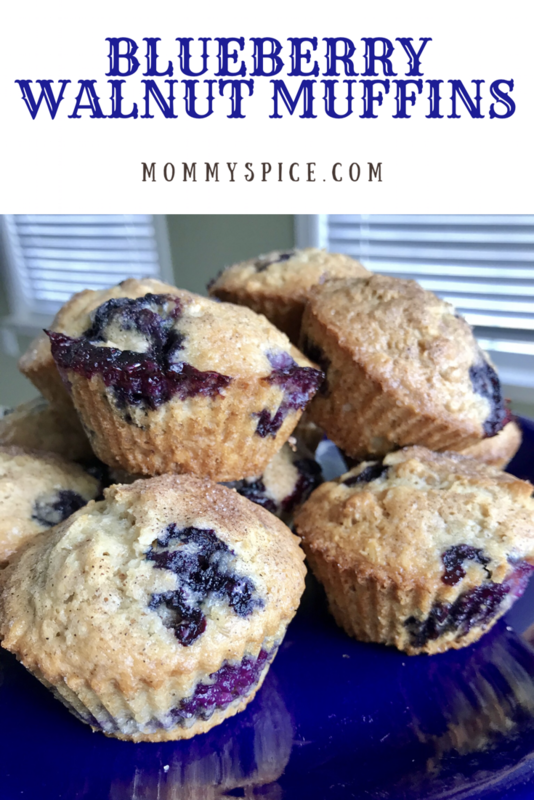 However, no matter your berry choosing method these muffins will turn out yummy! OMG, these are my favorite muffin and they are full of flavor and texture. I requested a batch for my Birthday and was pleasantly pleased to receive them. from Mommy Spice herself. Lucky I am!